Hauntworld Magazine issue 43 is about to ship and you can grab your subscription at www.HauntedHouseMagazine.com today. The latest issue features Netherworld Haunted House where you learn the secrets of what makes this the most successful haunted house in America. You can't miss this issue! Single issues are also on sale now! 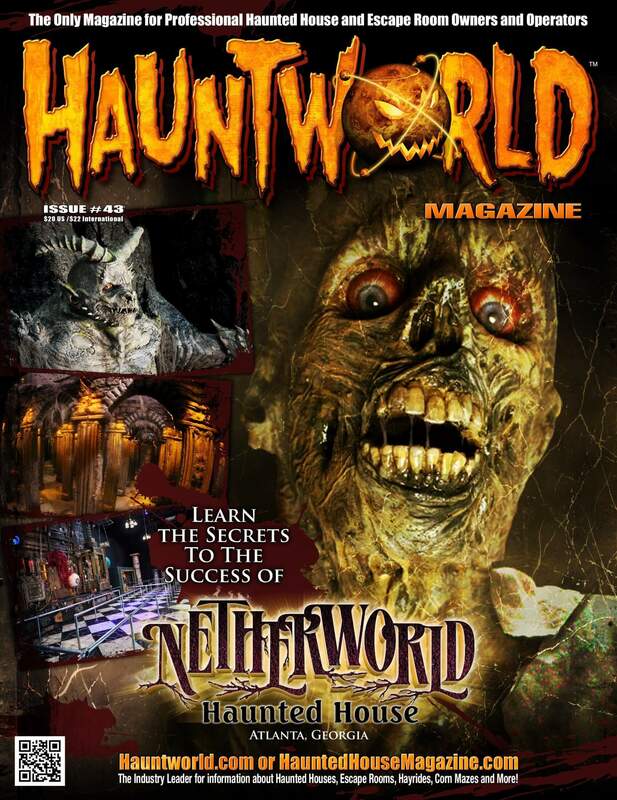 Additionally we want to announce that starting with Hauntworld Magazine issue 44 (Due in February) the magazine will shirt to cover not only the haunt industry, but escape rooms, hayrides, corn mazes, zombie laser tag, and any and all things related to creating revenue for peopel within our industry. In other words many haunt owners are now doing Christmas shows we'll explore that as well as Escape Rooms to VR, to how to profit by a retail store or food stand. If it is something our industry is exploring, operating, or could be the next big thing we're covering it all. Get your subscription today! Weird Tales – The Many Themes of NETHERWORLD Haunted House! Georgia Haunted Houses are some of the scariest and best in America! Hauntworld.com rates and review the best and Scariest haunted houses, haunted attractions, and Halloween events in America! Netherworld Haunted House is located in Norcross, Georgia. Netherworld is one of the best and scariest haunted houses in Georgia. Read the full review and story of Netherworld in Georgia. Please share this page and leave your reviews of one of Georgia's best and scariest haunted house. When you find yourself in the Atlanta area go to Netherworld. This attraction is also rated the longest haunted house in the World. Read our full review here. This article will showcase the history of over 20 years of original themes, icon monsters, and much more from Netherworld in Atlanta, GA. Netherworld attractions tens of thousands of customers including famous movie stars, and lines that stretch for miles to experience something new each year. Now prepare to learn the history and backstory of 20 years of fear! While elaborate complex themes and backstories are common in modern Haunted Attractions, it was not the case twenty years ago. One of the things that made NETHERWORLD different back in the early years and still keeps it relevant in the modern age is the use of complex stories to both connect it from season to season and create a fresh start for marketing and production design each and every year. What follows are VERY short descriptions of the themes of NETHERWORLD from its first season to 2016. If you would like to learn more, see the museum page of www.fearworld.com or find our weekly blogs counting down till opening day of the 2016 season, year 20 of NETHERWORLD Haunted House! Year 1 1997 The Colber Mansion - The gateway to the NEHERWORLD is opened by Maxmillan Colber for the first time and a legion of horrors emerge! The first year haunt featured a vortex tunnel, original monsters and a giant fish like biting puppet called the Netherspawn. The first icon Character was also introduced: the nightmarish Angel of Death! Year 2 1998 Vampire The Masquerade and Vault 13 - The haunt featured characters from White Wolf games such as a Nosferatu Vampire, a massive werewolf and a tentacled war ghoul, in addition to storylines, sets and concepts from the games featured in its WORLD OF DARKNESS series. The second attraction began with a descent to a secret base buried deep within the earth via an elevator effect, bizarre mutations, alien artifacts and a 1 million volt Tesla coil! Year 4 2000 Primeval, NETHERWORLD Extreme 3D Haunted Mansion and Blood Feast - Guests were sent back in time to a prehistoric jungle to confront giant spiders, man-eating plants, dinosaurs and primitive beast men. The Extreme 3D Haunted Mansion featured ghosts and the supernatural housed in a creepy mansion. Bloodfeast was an offsite guided tour of an elaborate Medieval Torture Chamber filled with extreme gore! Year 5 2001 Buried Alive and Planet X in 3D - The main show revolved around the reanimated dead of a twisted monastic order controlled by a weird creature from another dimension. Planet X in 3D was filled with aliens, spaceships, pure science fiction and a visit to an optically amazing alien world – Planet X! Year 6 2002 Inner Sanctum and House Of Creeps in 3D - The mad Dr. Vargas created a device to make his patients’ fears into reality in Inner Sanctum and guests had to confront these horrors along with the inmates of his notorious asylum as they attempted to escape the haunt. House of Creeps in 3D revolved around a twisted sideshow filled with oddities and demented clowns, along with the bizarre illusions that a 3D show provides. Year 7 2003 Dark Harvest, Vault 13 the Berserker Project and Tomb Of Darkness - Dark Harvest was an unsettling adventure through rural horror with scarecrows, abandoned farms, inbred townsfolk and of course, an encounter with the savage moss covered Harvestman. A return to VAULT 13 featured a secret base totally choked with green fog swarming with grotesque mutants, and the first year of our downstairs show had guests explore a pitch black Egyptian tomb of an accursed queen who had been purged from history… Necrotis! Year 9 2005 Abomination, Terror On Tiki Island in 3D, and Slaughterhouse - An aquatic warlord of the Dark Ones emerges from the ocean to lead monstrosities into battle in Abomination! Terror on Tiki Island in 3D featured amazing artwork that captured the beauty and horror of a lush tropical island gone mad, and Slaughterhouse explored the dark evil at work in the depths of a long abandoned meat packing facility! Year 10 2006 Cursed, Shock O Rama in 3D and Freakpit -The 10 year anniversary of the haunt heralded the return of Maximillian Colber from the depths of the NETHERWORLD telling of the nightmares soon to unfold in the Cursed places of our earth. Shock-O-Rama in 3D delved into the craziness of pre-comics code “funny books” and Freakpit featured Dr. Bile’s collection of freaks taking up residence in Mann’s Slaughterhouse. NETHERWORLD appeared on CBS this Morning on Halloween this year in a very positive story on haunted attractions around the country. Year 11 2007 Leviathan and Primal Fear - This year the upstairs Haunt that had previously been separated into two attractions was merged to create a much larger haunt called Leviathan. The theme was based on the Frankenstein legend with the creation of murderous flesh golems and an insidious plan to attack mankind. Primal Fear was a show encompassing as many of the deepest fears and phobias that one could possibly experience in a haunted house. This was one of the first years that NETHERWORLD was featured on the Travel Channel and it certainly wouldn’t be the last! Year 12 2008 Carnivore and Mangler - Carnivore was a show about werewolves at war with the forces of the NETHERWORLD, the midpoint of a three year arc of famous classic monsters that had begun with Leviathan. Mangler debuted a tale of a methodical serial killer devoid of human emotion and immune to pain. The character of the Mangler became the de facto icon character of the downstairs show for years to come due to his popularity, and returned as a featured player or at least in a cameo role in all most all of the downstairs haunts from that point forward. Year 13 2009 Blood Night and Zombie Rampage - In Blood Night the vampire lord Ghoulich devised a plan to black out the Sun so that vampires and creatures of the NETHERWORLD could ravage the earth without the fear of daylight. In Zombie Rampage, special chemicals developed to help soldiers fight better and to heal wounds get added to a popular energy drink, and when spilled into a local graveyard cause a…you guessed it… zombie rampage! Year 14 2010 Gargoyle and Dead Salvage - Part 2 of the Blood Night saga sees an invasion of Gargoyles betraying the vampires in an all-out assault on both humans and undead. Dead Salvage explored the return of the Mangler as he began creating zombies with robotic parts in an indoor junkyard. Year 15 2011 The Nightmares and Raw Meat - The final chapter of the Blood Night story featured the Gargoyles rulers, the Nightmare Kings, locked in all-out war with vampires and humanity. Raw Meat exposed alligators, mutants and worse living in the sewers and storm drains deep beneath us all! Year 17 2013 The Dead Ones and Boogeyman – In The Dead Ones, The Inquisitor, a servant of the NETHERWORLD rises from YS to judge mankind. He finds that we have abandoned the old ways and summons the DEAD ONES – Skeletal life draining horrors to punish us. In Boogeyman, six innocent people are trapped in comas, their minds imprisoned by a legendary creature that takes the form of your greatest fears. Year 18 2014 Season Of the Witch and Spliced - The Witches seek to stop the DEAD ONES by appeasing the Inquisitor. On Halloween they release creatures and spirits in a celebration of the old ways, but the doorway swings too wide and ghosts escape the NETHERWORLD in mass! In Spliced, clones created for black market organ harvesting are corrupted by the Mangler to become bizarre and deadly new forms of life! Year 19 2015 The Rotting and Vault 13: Unearthed - The invading ghosts are draining the life from people causing them to become energy starved zombies called The Rotting! Vault 13 is taken over by an Artificial Intelligence called Proteus that uses its robotic defense systems to capture the Mangler and his clone creations. Year 20 2016 Monsters and Vault 13: Meltdown - Primordial artificial lifeforms called Soul Eaters or Goloths are released from their Antarctic prison to cull the ghost population, but they rapidly spread and threaten all life on earth. Only the return of the legendary monsters of the NETHERWORLD has a chance of stopping them, but no matter what side wins we lose! In Vault 13: Meltdown, Proteus demands that the Manger make him a bride or he will set off all the warheads in the Vault creating a nuclear meltdown! And there you have it, a snapshot list of all twenty years of NETHERWORLD Haunted House! We hope you get a chance to come see us this year as we celebrate our 20 Seasons of Screams! Ohio Haunted Houses are some of the scariest and best in America! Hauntworld.com rates and review the best and Scariest haunted houses, haunted attractions, and Halloween events in America! Factory Of Terror is located in Canton, Ohio. Factory Of Terror is one of the best and scariest haunted houses in Ohio. Read the full review and story of the Factory Of Terror in Canton. Please share this page and leave your reviews of one of Ohio's best and scariest haunted house. When you find yourself in the Canton area go to Factory Of Terror. This attraction is also rated the longest haunted house in the World. Read our full review here. The Factory of Terror, located in Canton, Ohio, is the LARGEST INDOOR HAUNTED HOUSE IN THE WORLD. The Factory has been recognized by Guinness World Records three times for this achievement. There are plenty of haunted houses in Ohio, but none MANUFACTURE NIGHTMARES as startling and as intense as the Factory of Terror! Factory of Terror's reputation for industrial thrills and chills draws massive crowds from the tristate area every year. This enormous haunt is more than a mile long and consists of five unique spine-chilling attractions; The Asylum, Industrial Nightmare, Labyrinth of Darkness, Massacre on Mahoning, and The House of Nightmares. All five attractions (or scare zones) operate linearly and are re-queued along the way to maintain spacing between groups. Every haunt’s queue line is indoors and out of the weather, a big plus when dealing with NE Ohio’s unpredictable weather. To take advantage of every minute, talented actors and performers are scattered throughout the queue lines to entertain patrons as they anxiously await to enter each attraction. Halfway through the heart-pounding tour, patrons can take a breather and enjoy concessions with their friends at the “Monster Midway”. Here, guests can also have some fun with the plethora of photo ops. Over the years, this once quick pass-through area has emerged into a fun filled gathering place full of activities. It also allows timid patrons time to calm down, regroup, and gather their courage to continue on. Not only do these five attractions have some of the most HIGHLY DETAILED AND ELABORATE SETS in the haunt industry, they are paired with an incredibly talented team of scare-actors and specialty performers. The Factory of Terror employs over 130 actors and staff, in addition to more than 500 of the industry's scariest monsters and high tech animatronics. The Factory of Terror has committed itself to keeping up with current product developments in the industry as well as the trends of the culture, both of which are reflected in the guests' experience. Your journey begins in the Asylum, filled with the crazy and the corky. Deep in the heart of the Asylum you will experience the best mirror maze in the country.This perfectly engineered reflective and disorienting mindgame completely absorbs your sense of direction, making you question whether “seeing is really believing”. Many customers revisit this attraction to “figure out the secrets”, only to be victimized again by their own delusions of control. Industrial Nightmare showcases and brings to life dangerous details from the original factory, while taking you to a time in history that cared very little about safety and security. It is Industrial Nightmare that truly reflects the industrialism and terror that makes this haunt so unique. Why is there a mansion in middle of a factory? As the story goes, the aluminum foundry was unable to turn a profit. Convinced that the workers were to blame for his losses, the owner, Mr. Winters, decided to build a house in the middle of the production line. His constant presence was remarkably effective until his mind became fragile due to the dark, desolate environment. Using the factory’s own tools and equipment, Mr. Winters went on a random killing spree before adding his personal cemetery inside the walls of his factory mansion. The House of Nightmares, a literal nightmare, is a highly detailed haunt containing a mixture of animations, blood, guts, and gore…promising to leave you with many disturbing memories. If and when you get out, it won't be with your senses in tact. The Factory of Terror originated within the walls of the old Hercules Engine Factory on Market Avenue in downtown Canton, Ohio. The factory opened in 2000; however, being located in the middle of the city offered multiple challenges. Therefore, in 2008, after running out of space and facing parking issues, owner John R. Eslich decided to pack up and move the entire attraction. The current facility, also located in Canton, Ohio was a former aluminum foundry, which once manufactured intake and exhaust manifolds (engine parts) for the automobile industry. Some of the parts produced at this facility are now showcased in various sections within the attractions. We caught up with John R. Eslich, owner and president of Factory of Terror, to reflect on what it takes to operate the massive production. "We have poured so much blood, sweat, and tears into what the Factory of Terror has become today. The most gratifying part of owning a Haunted Attraction is seeing customers create unforgettable memories with their friends. I'm very proud of our entire crew, from actors to ticketing staff, to designers…for working together and creating such an amazing production. It truly is a reflection of a strong team of many talented individuals." How much staff does it take to operate the World’s Longest Haunted House? "Each night, it takes approximately 130 people to operate the World’s Longest Haunted House. This includes fire and police support as well as supervisors, actors, make-up artists, box office employees, custodial, and support staff. Most of our employees are seasonal but we maintain 6-10 full time staff year-round. Contrary to popular belief, the work never stops." How do you prepare such a large group of actors each night? "The key to having all of our actors in full character and ready to scare in a short amount of time is good planning and great execution. Actors start arriving at the factory for makeup and costuming around 4:00pm, roughly three hours before the show starts. By 6:00pm most of the staff is on-site and getting ready for the night. A team member checks them in and distributes their costumes. We do not use masks; therefore, all actors must report to the makeup department. Then, one of 8-10 special FX artists begin applying makeup and prosthetics to transform ordinary people into extraordinary characters. Our team works together to produce the most horrifying and realistic characters in order to give our guests the best possible experience." "Branding is very important to us and a strong marketing campaign is critical in delivering the details of our product to the consumer. Each year we create original videos and promotional photos by using a mix of in-house, local, and well-known photographers and videographers. Months of preparation are necessary before releasing our marketing content. Alyssa Schipani, owner of DesignByAly.com shot all the photos in this article and recently wrapped up another professional photo shoot for our 2016 season. These images, combined with our original logos, create brand awareness. The pre-season marketing efforts ultimately sets the mood, long before guests ever purchase a ticket. It's critical to us that we stay ahead of the game on marketing in our industry. Not only are we creating our own unique brand, we offer various ways for patrons to connect with us. They can save money on tickets by utilizing social media, mailing lists, text blasts, and radio contests. You can even find us in the local Canton visitor travel guides. Guests can sign up on our website FOTohio.com to receive special offers via text and email." Since there is so much space, do you offer any other events or off-season events? "Five years ago, we made a commitment to open on every Friday the 13th –no matter what month it occurred. Some months were very difficult, like winter months with six inches of snow and 10 degree temperatures. We were the first haunted house in Ohio to attempt these “out of season events”. Today, other haunts in Ohio are starting to follow this tradition and open their doors in the off-season. If you are considering it, be advised that it is definitely more difficult than regular season operations, so do your homework." *In 2013 and again in 2015, The Factory of Terror opened and closed the season on a Friday the 13th. *Our newest tradition is opening for St. Patrick’s Day. Who doesn’t like St. Patrick’s Day? Who doesn’t like haunting? The Factory’s St. Patrick’s Day celebration with be on March 12 of this year which will be our 2nd time hosting the event. *In September 2015, we established Escape Canton, which features six high tech escape rooms. These rooms are fully interactive and incorporate physical games. Essentially, a group of willing participants are locked in a themed room with the ultimate goal/challenge of escaping and completing the mission. The group must work together and use elements around them to find clues and solve puzzles in order to escape the room within a certain time limit. Our escape rooms are tons fun and provide excellent team building activities with riddles and mental challenges along the way! We have had a lot of local corporations and businesses rent out the rooms for meetings, seminars, and team building events. *Four of our escape rooms are located inside the factory and open year-round. The other two are mobile units than can be transported to any location including local fairs and events. You can find out more about our escape rooms at EscapeCanton.com. What do you think was your biggest mistake when getting into the haunt business? I think one of my biggest mistakes when starting out was not networking with other haunters and attending trade shows. After I attended the HAuNTcon show in 2007, I think I have only missed 2 out of next 36 when counting HAuNTcon, MHC, TransWorld, and IAAPA. I have been to every Legendary Haunt Tour and look forward to continuing to attend all these tradeshows. I have found that the networking and friendships acquired at these shows is invaluable. This year, The Factory of Terror will be the host location for the 1st Annual Haunters Weekend. This is an educational and interactive event developed by Dan Hower, Alyssa Schipani, and myself. I'm really excited about it. Haunters Weekend will be the first educational event to take place inside a PROFESSIONAL HAUNTED ATTRACTION where you will build ACTUAL SETS! –That’s right, everything will take place inside the haunted attraction. The primary focus of Haunters Weekend is hands-on workshops and demonstrations, but it will also offer networking, social activities, and even inspirational tours. Even better, attendees will learn techniques and trade secrets directly from elite vendors and designers in the haunt industry. Haunters Weekend was created to give haunters the opportunity to "learn by doing" and to be able to obtain skills that aren't always possible in a conference room environment. Haunters are going to have a blast working with power tools, pneumatics, pyrotechnics, paint sprayers, stilts, sound systems, prop controllers and more. For example, when you register for a lighting design class, you will walk in a real set with no lights and by the end of the class, attendees will have learned what lights to use, what controllers to use, and most importantly, how to install all of these things hands-on. When the class is complete, the set will be fully lit. That is how each class is designed. Of course, there will also be a lights-on tour of Factory of Terror exclusively for registered attendees. The three day event will start on Friday, May 13th and continue on May 14, and 15, 2016. There are limited spots available for select classes. For more information or to register, go to HauntersWeekend.com. What was one of the best things you have done in the haunt business? The best thing was to join the Haunted Attraction Association (HAA). The Haunted Attraction Association is the only official Association for the haunt industry. HAA represents professional haunted attraction owners, operators, designers, vendors, enthusiasts, and artists. More importantly, it's a portal for exchanging ideas, information, and experiences via conferences, networking events, message boards, newsletters, and more. HAA is a program that I can really give back to and help make the industry better as a whole. The HAA is operated by a Board of Directors. Every member of the Board has years of experience and is considered an expert in the haunt industry, for one reason or another. HAA members are encouraged to reach out to any Board member for advice or consultation at any time. I was elected to The Board of Directors in 2012 and held the office of Treasurer. For the past two years, I have held the office of President. HAA’s mission is to promote, protect, and educate. The HAA strives to inform the haunt industry through an amazing education program called C.H.A.O.S. C.H.A.O.S. is offered each year at the TransWorld Halloween and Attractions show. Here, haunt owners and operators learn the necessary steps and procedures of operating a safe attraction. After completing the safety course, they receive a certificate that can be used to show their fire marshal, insurance carrier, and local authority demonstrating their commitment and desire to run a safe haunted attraction. The best advice I can give is to get involved, ask questions, and share information. Chances are, it will make you smarter, help you operate a safer and more efficient attraction, and establish lifelong friendships.